Synopsis: A Cambridge physiologist, Frank Lewis, is chosen by NASA to train as an astronaut. He relocates to Texas and, following a rigorous selection process, is accepted for the project. He embarks on a lengthy training schedule and begins to design and construct a “fatigue detector”, i.e. a device that will provide an objective assessment of how tired an astronaut is. Various social alliances form within the multinational team and Lewis acquires an American girlfriend. He accepts the position of scientific observer on a deep-space mission, with the intention of testing his device. Shortly before he is due to blast off he is involved in a car crash and the book concludes with him recovering in hospital from his injuries. 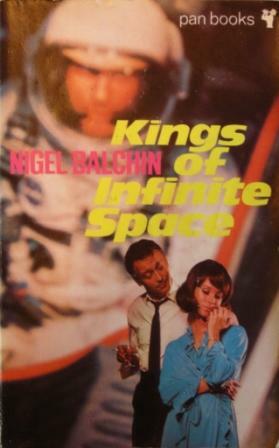 Context: Balchin spent the summer of 1966 touring space stations in Florida, Texas and California as he researched the background to the book. Verdict: It’s not as bad as everyone seems to make out! The narrative is quite enjoyable, and moves at a fair pace. Unfortunately, the characterization is not very convincing and the quality of the writing is a long way below Balchin’s best. The technical details of the space programme are interesting, although admittedly their appeal has waned given that interest in the space race has declined sharply since the book was written. Despite all its faults, it remains a very readable and accessible account of an important period in American history. Availability: It didn’t sell particularly well so copies are a little scarce but should not prove that hard to track down.